Ugly Art Room (UAR) is a curatorial art project located in Corvallis, OR. It shows original artwork from visual artists at all career levels from the United States and beyond. 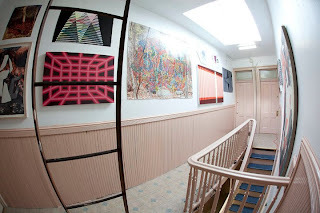 UAR began in Greenpoint, Brooklyn in 2010 as a roving curatorial art project. In addition to traditional art exhibitions, UAR seeks unusual and unique spaces to curate art exhibits in order to present work in consideration of its relationship to its environment physically, conceptually and historically. This adds a challenge to the curatorial process where context is brought to the forefront and a story develops between the artwork and the space. Ultimately, a unique and inspiring viewing experience results. Ugly Art Room was founded by curators Julie Feldman, Martin Esteves and Jen G. Pywell. Recently, Chelsea Foss Van Denend has joined the curatorial team. UAR welcomes guest curators and seeks artists for solo exhibitions in its Corvallis gallery.